These easy, delicious bars are the perfect quick dessert! 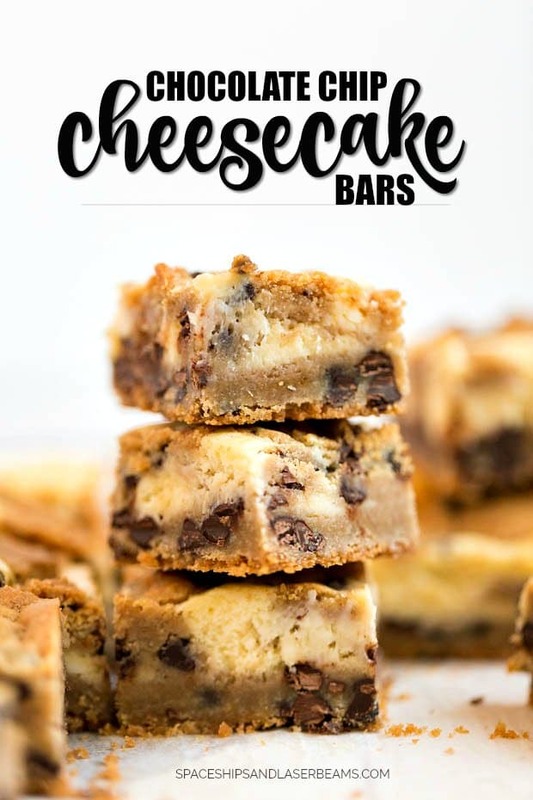 These chocolate chip cheesecake bars are so easy to throw together and require only four ingredients. 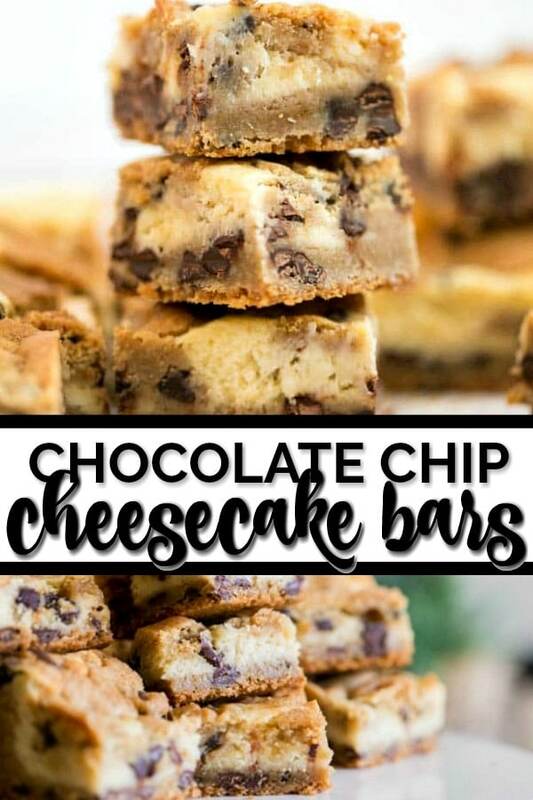 If you’re a fan of cheesecake and chocolate chip cookies, these will not disappoint. For more amazing cookie bar recipes, check out our chocolate chip cookie bars and our five star bars. 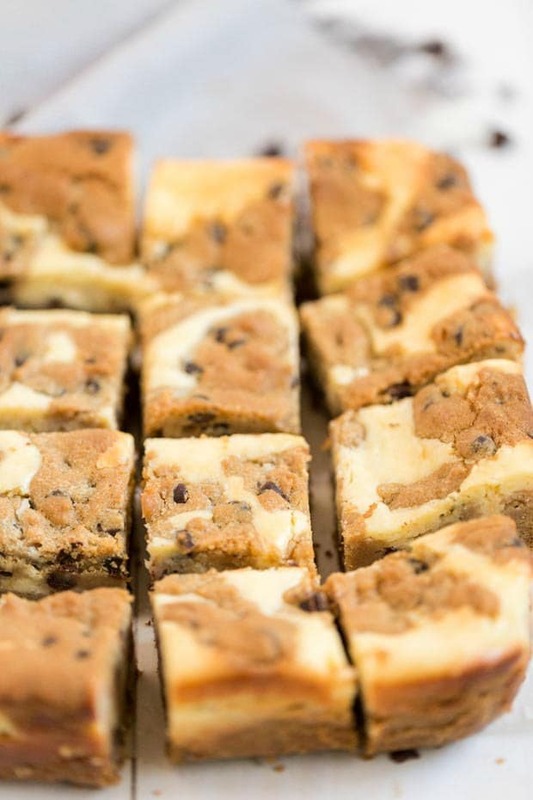 These bars combine several of my favorite things: chocolate chips, cheesecake, and cookies — baked and then sliced into squares. Yum! I am a huge sucker for cheesecake of any kind. It’s probably my all time favorite dessert. But, a close second is just classic, soft chocolate chip cookie. Now imagine putting these two together! With only four ingredients required and an almost non-existent prep time, this has become one of my frequent “quick” desserts to make. You can find the full recipe in the recipe card below. I love the ease of this recipe. These bars are so much easier to make than cheesecake but just as delicious in my mind. Start off by preheating the oven to 350 degrees F to allow it to heat up while you prepare things. Next, line a 9-inch square baking dish with parchment paper. In the prepared dish, spread a little over 1/2 of the cookie dough onto the bottom, right over the top of the parchment paper. Make sure to press the cookie dough down firmly with your hands. Begin beating the cream cheese by itself until it’s light and fluffy. I use a stand mixer to do this! Then, beat in the sugar until the two are well combined. Finally, beat in the egg and vanilla until the mixture is nice and smooth. Pour this filling on the top of the cookie dough already in your dish. Spread it evenly over the cookie base. Lastly, crumble the rest of the cookie dough over the top of everything. The best part about these bars is that you can bake everything together, making it a super quick one step recipe. 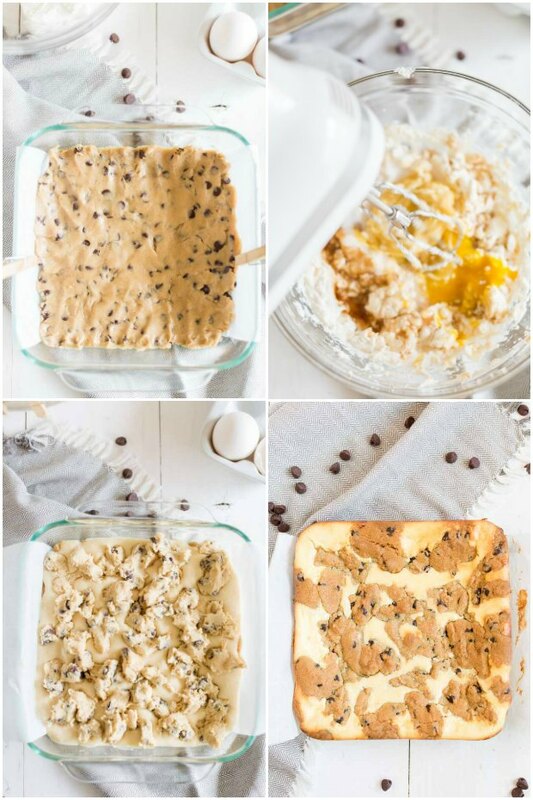 No need to bake the cheesecake part and the chocolate chip cookie part separately. Simply put it all together and throw it in the oven. Usually 30 minutes is a long enough bake time for me, but they might need just a little bit longer which is why I say 30-35 minutes. Try to keep an eye on it when it gets to the 30 minute mark and finish baking it to your liking! When the top cookie layer is starting to look light golden brown, you will know they are done! The ease of this recipe continues, as these bars are super easy to store. I like to store them in the refrigerator, to keep the cream cheese. Plus, I just think these bars taste amazing when they are chilled! Most of my baking dishes have lids that fit on them, so I just pop the lid on and put them in the fridge. I’m a big fan of these cookie bars. They are easy and quick to make. The cream cheese makes them so creamy and soft while the cookie part adds crunch and sweet flavor. I hope you’ll love them too! Line a 9-inch square baking dish with parchment paper. Spread 1/2 + of the cookie dough onto the bottom of the baking dish. Beat the cream cheese until light and fluffy with a stand mixer. Beat the sugar until combined. Beat the egg and vanilla until smooth. Pour this filling on the top of the cookie dough. Spread over the cookie base. 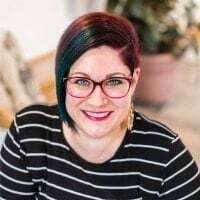 I’m excited to partner with Disney Books to bring you these ideas. Over the past few years, one of my favorite new traditions we implemented is hosting a kid’s Christmas party in our home. I was inspired this year by the release of Ryan T. Higgins latest book: Santa Bruce. If you haven’t yet read any of the Mother Bruce series, I suggest you change that ASAP! The entire series is extremely amusing for both kids and adults. I knew the whole crew would get a kick out of the book and I couldn’t wait to share it with them. After becoming the victim of mistaken identity, Bruce finds the whole forest lining up to give him their Christmas wishlists. Hilarity ensues and giggles will abound as kids (and parents!) enjoy this amazing story about this bear who just can’t catch a break. For our shindig, I took over the boy’s playroom to create our Santa Bruce inspired Christmas party. I covered the table with brown butcher paper. I love the look of it, plus it makes clean up such a breeze. I used simple, white paper plates. I also had disposable white cups for the kid’s hot chocolate. Each place setting had stickers so the kids could decorate their hot chocolate cups to their liking. I found some red and black buffalo check fabric that I had cut into napkins. I kept the table decor simple with small pine cones and mini trees wrapped in burlap. Once the guests arrived, they got busy with some Santa Bruce activity sheets. They also each got their own Santa hat to wear. After snacking and reading, there was a gift exchange. We set a $5 limit to keep things fair. It’s always fun to watch the kid’s faces while they’re opening their pick. At the party food table, I used black and white buffalo check fabric, gingerbread house cut outs, simple white trees and a Santa Bruce ornament plus the book. I laid crayons out on the table so kids could color, complete the maze and draw their own Christmas wish list. 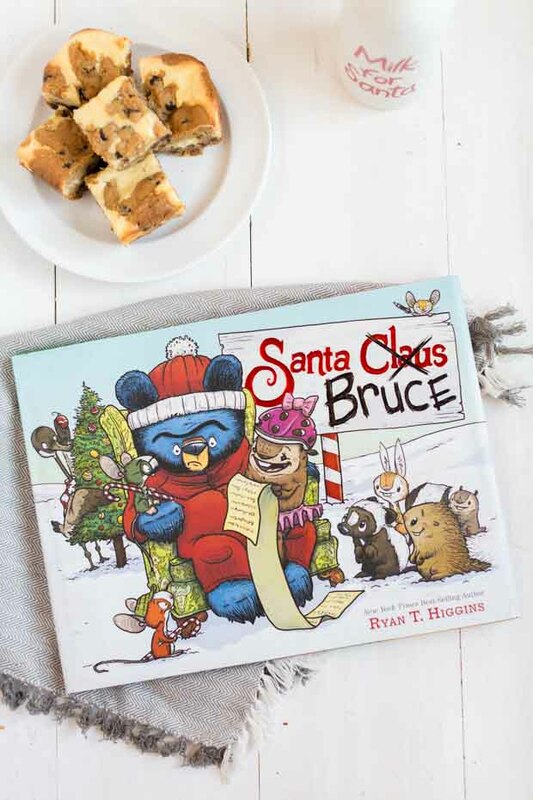 We always read a Christmas book and I knew the kids would get a big kick out of Santa Bruce and I was right! It was an instant hit. I like this ideas! chocolate chips recipes is very easy to follow 🙂 can’t wait to baked for our upcoming kids party. 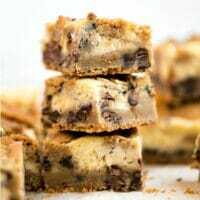 Oh my the chocolate chip cheesecake bars look amazing! Yum! Sharing! Thank you for sharing on Merry Monday! Hope to see ya next week! Ooooo!!! I love these ideas! It’s inspired me to have a neighborhood kid party at my house! 🙂 I’m going to have to copy you. 🙂 Love the idea of decorating their own hot cocoa cups. PS The CCC bars look delicious!